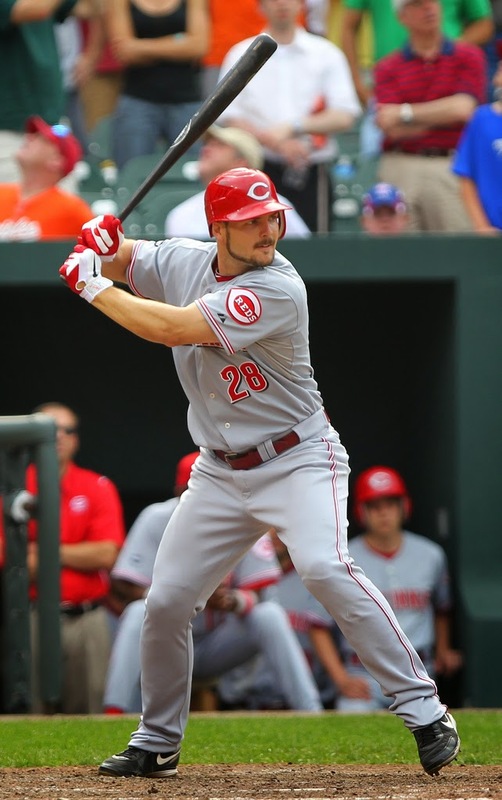 With Chris Heisey set to hit his third year of arbitration and likely clear the $2 million mark, the Reds flipped him for Dodger pitcher Matt Magill. Heisey was someone that the blogosphere loved as he came up. A 17th-round pick, he was usually not rated very highly on prospect rankings, but he played his way to the big leagues. Although he's shown decent power in the minor leagues (along with decent patience, sometimes), he surprised a lot of us in his 2011 campaign when he smacked 18 home runs in part-time duty, often as a pinch-hitter. Nevertheless, he never really secured a full-time job. We definitely saw Heisey become increasingly aggressive during his years with the big league club, and more contact-oriented. His walk rate 7% to 6% to over around 4-5% from 2010-2014, his swing % increased from 48% to 53%. He, strangely had a bit of a reversed split over his career (0.295 wOBA vs. LHP, 0.323 vs. RHP), which made it harder to leverage his offensive talents via a platoon. So, what we have is a very nice 4th outfielder who could play all three outfield slots effectively, provide some power off the bench, and someone who could (theoretically) fill in for an injury whenever needed. Unfortunately, it always seemed like the times that Heisey did get a chance to play every day as an injury replacement were the same times he fell into bad slumps. The wrap on him was that that he became exposed as his playing time increased, and there might be some truth to that. I saw Magill while sitting with a veteran scout who said, “Magill has more stuff than Kevin Slowey.” And while I can hear the whistling of thousands of index fingers twirling in the air in unison, that’s a pretty impressive feat considering Magill was a 31st round pick. With an 89-92 MPH fastball and slider which flashed plus, Magill has the ceiling of a number four starter with the floor of an excellent ROOGY. Prospect followers will want to point to the lofty strikeout totals as an indicator he has more in the tank, but his slider is a real out pitch against minor league hitters and just won’t be as effective against big league hitters. Unfortunately, upon arriving at AAA, Magill has encountered what appear to be tremendous control issues, walking ~6 batters per 9 innings across 160 innings in AAA in 2013-2014, posting a lovely 9.1 bb/9 in 27 innings with the Dodgers in 2013. Yikes. For someone who doesn't throw particularly hard and doesn't have a reported overpowering secondary offering, it's not very encouraging. So, yeah. Shrug. Maybe someone in Cincinnati thinks they can fix him. And what do you expect in return for someone you were about to non-tender anyway?